AFL Report - Week 3: Run, Travis, Run! Week 3 of the Arizona Fall League season saw the Salt River Rafters climb into first place in the East Division as they went 4-2 in their six games. Travis Blankenhorn filled the runs scored category on the stat sheet in four games, including a game in which he crossed home plate for over half his teams total on the scoreboard. Griffin Jax put in a fine starting effort in another game his team ended up losing, and a reliever picked up his first save in the AFL. The Minnesota Twins’ group pitching prospects put up a combined 3.60 ERA and 1.20 WHIP on the week in 10 innings pitched, while the two remaining hitting prospects combined to go just 5-for-24 with 10 strikeouts, but all the players had their moments on the week. Keep reading to find out just how much Blankenhorn had to run, and how all the other Twins prospects fared in Week 3 of the AFL season! Brent Rooker: Will not play in AFL (ankle injury). As updated in last week’s AFL report, Jonathan Mayo of MLB.com had an update on Rooker’s status as part of an interview with Travis Blankenhorn and updates on all the Twins prospects participating in the AFL. They’ve decided to shut him down due to his ankle injury rather send him out to Arizona for an abbreviated stay. Guess that means we will just have to wait until Spring Training to see him back in action! Griffin Jax: 1 start, 4.0 IP, 3 H, BB, 1 ER, 3 K; 3.38 ERA, 1.38 WHIP (overall). In their 6-5 loss to the Scottsdale on Thursday, Jax got the starting nod and did his part with four strong innings. He allowed one earned run on three hits and a walk while striking out three in the outing. He sent the Scorpions down in order in the third and his run allowed came with two outs in the second inning after his only walk was followed by a triple. The leadoff man for Scottsdale also started the game with a single, but Jax picked him off at first base later in the frame. He threw 53 pitches (31 for strikes), including six swinging strikes and recorded four groundouts compared to two flyouts on the game. When he was done the Rafters held a 4-1 lead, but their bullpen would implode in the seventh inning, allowing the Scorpions to score five runs and take the lead for good. Luke Raley: Did not play, removed from roster; .214/.333/.357 (overall). In the same article from Jonathan Mayo above, news first came out that Luke Raley had been removed from the Rafters roster. He was removed to start the bottom of the sixth inning in Salt River’s 13-4 loss against Peoria on 10/15, and that appears it will be it for the outfielder in the AFL. If I’m able to find any updates on the reason why he was removed (I’d assume an injury of some sort at this point), I’ll be sure to update you all! Hector Lujan: 2 appearances, 1 Hold, 2.0 IP, 3 H, 0 BB, 2 ER, 2 K; 9.64 ERA, 2.14 WHIP (overall). Lujan and the rest of the Minnesota Twins reliever prospects made their first appearances of the week in Tuesday’s 7-5 win at home against the Surprise Saguaros. Lujan would come on for the eighth inning with the score 7-3 in favor of Salt River, but a single, ground-rule double, and an RBI groundout put closed that gap to three before he escaped further damage. Of his just 10 pitches in the inning, eight went for strikes as Saguaros hitters were aggressive, including top prospect Vladimir Guerrero Jr. who swung at the first pitch he saw and flew out to center field. Lujan topped out at 95.8 MPH on the Surprise gun in this one (it seems to be random which game of the day will log pitch speeds in the Gameday logs). His second appearance of the week came in Friday’s 9-2 win over Peoria and he was the first reliever summoned in this one with Salt River out front 3-1 through five innings. He was credited with a hold as he kept his team in front but did allow the second of the Javelina’s runs on the day. It came courtesy of a solo home run on his first pitch of the inning, but he responded well by retiring the next three hitters, including two strikeouts. Of his twelve pitches in this one, eight went for strikes including four swinging. Travis Blankenhorn: 4 games, 3-for-12, 6 R, 2B, RBI, 3 BB, 3 K, SB; .188/.316/.250 (overall). The infielder was very active again this week, as he appeared in four of his teams six games, starting it off with a bang on Tuesday against Surprise. Blankenhorn scored four of his team’s seven runs in the victory batting second in the lineup and playing second base. He had two hits in three at-bats along with drawing two walks that led to all that running. He scored all the way from first base on triples from Rockies prospect Tyler Nevin in both the first and fourth innings. In between he led off the third with a walk, stole second base, and then scored on a single. In the sixth he led off the inning with a single and would score two batters later. His two hits on the day also gave him a four-game hitting streak. His second game of the week was notable for other reasons than his hitting line, as he would finish 0-for-4 with two strikeouts in the Rafters loss to Scottsdale on Thursday. It was noteworthy because he played the entire game in left field. This outfield exposure in the AFL comes after he logged 36 innings there for Fort Myers this past season. It will be interesting to see if his movement outside the infield diamond continues this fall and into next season. In Friday’s 9-2 win over Peoria Blankenhorn would again cross home plate multiple times despite a 0-for-3 game at the plate. Batting eight and back to playing second base, he led off the seventh by drawing a walk and would later score on a single. Then in the eighth he hit a grounder that was turned into a force out at second before a single brought him and another runner in for the Rafter’s final tally of nine runs. He would end his week by entering Saturday’s 11-5 loss to Peoria as a defensive replacement in the middle of the sixth inning. He would get a couple of at-bats in and made the most of his first one by delivering an RBI double into left field that gave Salt River the last of their five runs on the day. He reached first on another fielder’s choice in the eighth to finish 1-for-2. Devin Smeltzer: 2 appearances, 2.0 IP, 3 H, 0 BB, 2 K; 1.50 ERA, 1.33 WHIP (overall). Smeltzer was the first of the Twins three relievers to appear in Tuesday win over the Saguaros, coming in for the seventh inning with the score 7-2 in favor of the Rafters. He struck out the first hitter he faced and got a ground ball for the first two outs, but consecutive doubles would score a run before his catcher caught the runner attempting to steal third for the final out. In his inning of work, he threw 18 total pitches with 12 going for strikes. He worked around 90 MPH with his fastball in this one. In Friday’s win against the Javelina’s, Smeltzer was the next man up after Lujan and pitched the seventh inning with the game now well in hand 7-2. He again struck out the first batter of the inning before allowing a single to the next batter. But he quickly erased the possibility of further threat by inducing a double-play ball to end the inning and his appearance after just 11 pitches (8 for strikes, 1 swinging). Jaylin Davis: 3 games, 2-for-12, R, BB, 7 K; .219/.242/.219 (overall). Davis had another quiet week, picking up two singles and a walk in his three games, but those also came with seven strikeouts including a golden sombrero effort in one of them. Playing right field and batting sixth in Wednesday’s 10-9 win over the Scorpions, Davis finished 1-for-3 and scored a run in the sixth inning after drawing a walk that made it 7-5 Rafters. He struck out twice in this one. Friday’s effort as the DH batting fifth in the lineup is one he’d like to put behind him as quickly as possible even though his team was victorious in blowout fashion. In five trips to the plate he went down on strikes four times, including three swinging. Over the past two weeks Davis has struck out in 12 of his 23 at-bats so I’m sure he’ll be trying to cut those down and close out his AFL season on a positive note. Adam Bray: 2 appearances, 1 Save, 2.0 IP, 2 H, 1 R (0 earned), 2 K; 1.29 ERA, 1.00 WHIP (overall). Bray was the final of the three Twins relievers to appear in Tuesday’s win over the Saguaros and tasked with closing out a three-run lead in the ninth inning. The leadoff man singled to start a rally, but a pop-out and a K got him one out away from picking up his first save in the AFL. Before he was able to coax a groundout to finish that off, a throwing error on a steal attempt and wild pitch resulted in an unearned run, but it was a Save all the same. Of his 14 pitches in this one, 10 went for strikes (2 swinging) and he sat around 90 MPH with his fastball on the day with his strikeout coming on a curveball toward the dirt. In Friday’s drumming of the Javelinas, Smeltzer again was summoned to finish the game, but no save would be in line as his team led by seven runs. He struck out the first hitter of the inning before giving up a single, but that would be it for his opponent as he quickly retired the next two hitters. 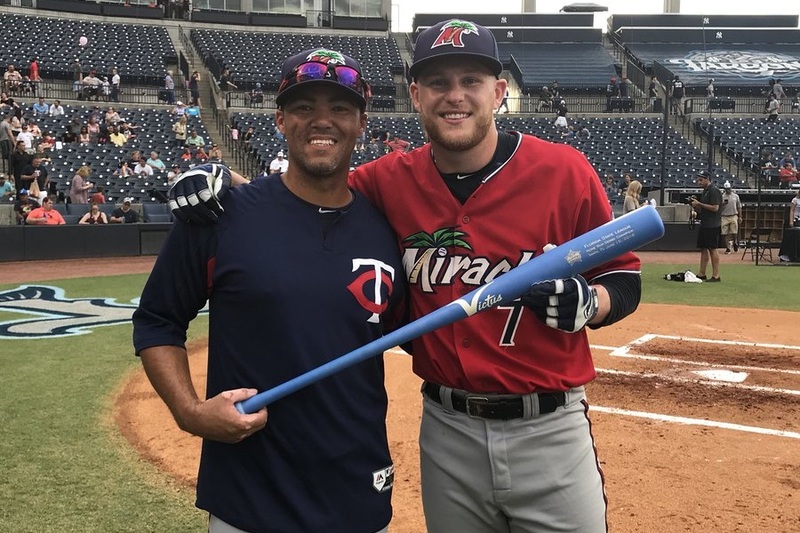 - The AFL’s Fall Stars Game rosters were announced on Monday, and the Twins Devin Smeltzer will be their lone representative on the East squad. It’s not really an “all-star” game in the sense of the league’s performers, but it’s always fun to see the level of prospect talent represented. Top hitting prospect Vladimir Guerrero Jr. and top pitching prospect Forrest Whitley highlight each roster and the game on Saturday in Surprise will include 13 of MLB.com’s Top 100 prospects. - MiLB.com’s fun “MiLBY Awards” are being handed out this week, and the Twins own Alex Kirilloff took home the honor as the staff pick for 2018’s Breakout Prospect. There’s a lot of good information in that link so definitely take a look, but the spray chart that reminds me of a Rorschach inkblot test is the best part in my opinion (behold the symmetry!). Please feel free to ask questions about the AFL and the players who are there! I commend you for the creative positivity of the headline, creating excitement, and enticing the the read to find Blankenhorn is ripping it up in the AFL. That isn't easy with a .188/.316/.250 line. All in all, other than Smeltzer and Bray so far, this seems like a total bust for our Twins contingent. Jax seems to be performing well, and it's good for him to get the additional innings, I think. Too bad Rooker isn't going to play at all. Jaylin Davis's four-hit night last night should help! Thank you, it's still fun to pay attention to and write about! I've done stuff like this about the AFL since before Twins Daily was around. I love to follow it during this time of year. In relation to your "bust" statement, a criticism I would have of the new Front Office is how they've used the AFL the past two years. Granted, it's really tough when two of your players, including the top prospect you were trying to send, are unable to play; but the talent level they have sent has been considerably less than in the past, in my opinion. Plenty of reasons this could be, but the first year I maybe thought was a chance anomaly, this second year is a coincidence, and a third year like this would be a pattern. Could be they just don't see as much value in the league as others do or the Twins have in the past. → Article: AFL Report - Week 3: Run, Travis, Run!